Flip Out Mama: Hot Gift= Fisher Price Laugh & Learn Play & Dance Puppy! 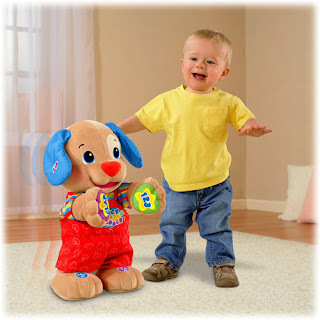 Hot Gift= Fisher Price Laugh & Learn Play & Dance Puppy! Oh, Fisher Price. You always come through at the holidays, with gifts for my boys that are durable, educational, cute and affordable, and this year is no different! My sweet little Bean is getting bigger, and he needs to be entertained now.. So, when we received the Laugh & Learn Dance & Play Puppy, I knew this would be just perfect for him! He's pretty darn cute isn't he!?! Who’s ready to wiggle and dance? 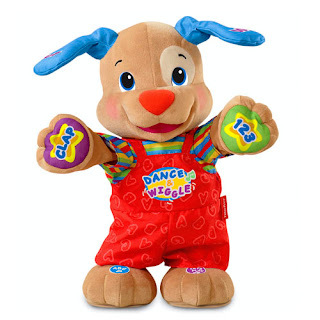 The Dance & Play Puppy comes to life with baby-friendly motions, lively songs, irresistible wiggles and plenty of interactive learning fun! Two modes of play help baby learn through songs, phrases, movement and games. Puppy guides baby through motions (Let’s clap!) to foster language development and how to follow directions. And there are plenty of surprises to delight baby—like ears that move up and down! Requires 6 AA batteries. • Two modes of play help baby learn through motion & music, or just wiggle, sing & have fun! • Keeps babies having fun—they won’t even realize how much they’re learning! • Parts of the body and more! This is going to be just perfect for him! I know he is going to love it, and I am so happy that it will actually be teaching him as well! How awesome is that! Plus, at around $40.00, this is a very reasonably priced "big toy" for the holidays! If you wanna get one of these for your little one, just click here! I received a sample product free of charge in exchange for this post. Although a sample was received, all opinions are my own.No monetary compensation was received.